By LUDWIG VON KOOPA - The Super Smash Bros. family. Everything at Nintendo's E3 2018 seems to begin and end with Super Smash Bros. Ultimate. 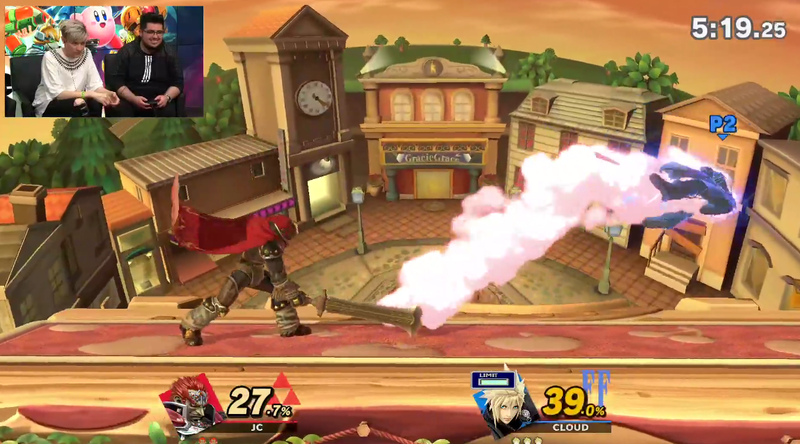 Since Leffen showed up as a substitute at yesterday's Invitational tournament but didn't get to play, he makes up for it by appearing on the Nintendo Treehouse Live stream against ZeRo! Thankfully, this is the very last log of the day. You can look back at all of the great stuff in the E3 2018 Schedule article! [7:05 PM] Ludwig Von Koopa: We're back. [7:05 PM] Ludwig Von Koopa: Jordan Kent, TKBreezy, Leffen, and ZeRo. [7:06 PM] Ludwig Von Koopa: They're asking Leffen and ZeRo to just play Smash 1v1s. [7:06 PM] RawkHawk2010: I want more Aceeeeeeeees. [7:06 PM] RawkHawk2010: I like Zelda's alt. [7:06 PM] Ludwig Von Koopa: Zelda vs. Ike. [7:06 PM] RawkHawk2010: It's Dark Zelda from ALBW. [7:06 PM] RawkHawk2010: Whatever her name was. [7:06 PM] RawkHawk2010: Did you play that? [7:07 PM] Ludwig Von Koopa: Hilda? Hilda's hair isn't grey, though. [7:07 PM] RawkHawk2010: I played and beat that game but don't remember it. [7:07 PM] Ludwig Von Koopa: JC is thanking the Smash community. [7:08 PM] Ludwig Von Koopa: We haven't really seen Zelda in this game. [7:08 PM] Ludwig Von Koopa: But she's pretty much the same besides down-b. [7:08 PM] Ludwig Von Koopa: ZeRo is Ike, and Leffen is Zelda. [7:09 PM] RawkHawk2010: btw people think Shadow will be an Echo Character because Knuckles is an AT yet the Shadow AT is nowhere to be seen. [7:09 PM] Ludwig Von Koopa: Ike wins. [7:10 PM] RawkHawk2010: I'm so happy with Zelda's design. [7:10 PM] Ludwig Von Koopa: Villager vs. Fierce Deity Link. [7:10 PM] RawkHawk2010: And now basically every Zelda person is front a different game. [7:11 PM] Ludwig Von Koopa: So Sakurai's team had to make custom item icons for Villager's Pocket? [7:11 PM] RawkHawk2010: Link, Zelda, AND Ganondorf got de-TP'd. [7:11 PM] Ludwig Von Koopa: For every possible Pocketable thing? [7:13 PM] RawkHawk2010: I didn't think the bowling ball had that kind of range. [7:13 PM] Ludwig Von Koopa: Yeah it just falls down indefinitely. [7:14 PM] Ludwig Von Koopa: JC requesting Great Plateau Tower. [7:14 PM] Ludwig Von Koopa: Leffen is Cloud, ZeRo is Marth. [7:15 PM] Ludwig Von Koopa: The only reason ZeRo came back to the second tournament is because he won the first one. [7:15 PM] RawkHawk2010: This stage is gonna make me feel like I can pull out the paraglider when playing as Link. [7:15 PM] RawkHawk2010: Especially when someone is in the background already doing it. [7:16 PM] Ludwig Von Koopa: Better not play as Link. 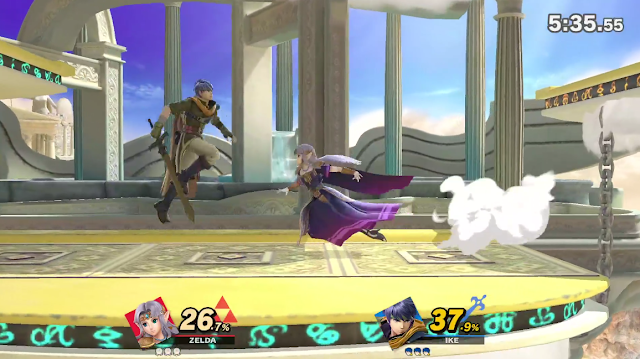 [7:18 PM] Ludwig Von Koopa: Marth carried Cloud across the stage and won. [7:18 PM] RawkHawk2010: Have we seen anyone play on Peach's Castle once? [7:18 PM] Ludwig Von Koopa: Only in trailers. [7:18 PM] Ludwig Von Koopa: JC is ready to play ZeRo. [7:19 PM] Ludwig Von Koopa: JC as Ganondorf. [7:19 PM] Ludwig Von Koopa: "Ganondorf been going on a diet and working out." [7:19 PM] Ludwig Von Koopa: JC hasn't landed a single hit. [7:20 PM] Ludwig Von Koopa: And he lost his first stock. It took Ganondorf 17 years to realise that using his sword in combat would be a really good idea. [7:20 PM] Ludwig Von Koopa: Cloud wins. [7:21 PM] Ludwig Von Koopa: ZeRo giving his tips. [7:21 PM] Ludwig Von Koopa: On JC's play. [7:22 PM] RawkHawk2010: Who is JC? [7:22 PM] Ludwig Von Koopa: JC doesn't shield, and he always jumps after getting hit, so ZeRo can pre-emptively jump. [7:22 PM] Ludwig Von Koopa: JC Rodrigo. [7:22 PM] Ludwig Von Koopa: The one Treehouser on stage. [7:22 PM] Ludwig Von Koopa: He's Treehouse's resident Nintendo-competitive community liaison. [7:23 PM] Ludwig Von Koopa: Mari0 being dumb. [7:23 PM] Ludwig Von Koopa: Which is canon. [7:24 PM] RawkHawk2010: That was like the Ridley trailer. [7:24 PM] RawkHawk2010: I know 4 had that black streak. [7:25 PM] Ludwig Von Koopa: Yeah. [7:28 PM] Ludwig Von Koopa: Ivysaur blew up. [7:28 PM] Ludwig Von Koopa: Confirm stage hazard toggle. [7:29 PM] Ludwig Von Koopa: And Battlefield and Final Destination versions of every stage. [7:29 PM] RawkHawk2010: That wasn't confirmed? [7:29 PM] Ludwig Von Koopa: So yeah, no complaints there. [7:29 PM] Ludwig Von Koopa: It was implied but a Nintendo employee didn't say it. [7:30 PM] Ryu: Don't they mean the omega stages? [7:31 PM] RawkHawk2010: I can't see Cappy. [7:31 PM] Ludwig Von Koopa: There's three things you can do to a stage. [7:32 PM] Ludwig Von Koopa: 3. Final Destination (flat) version of a stage. [7:32 PM] Ludwig Von Koopa: ZeRo is crushing poor Leffen. [7:32 PM] RawkHawk2010: Is Cappy just not on the Waluigi hat? [7:32 PM] Ludwig Von Koopa: I haven't seen Cappy once. [7:32 PM] RawkHawk2010: Maybe he's not in the E3 build. [7:32 PM] Ludwig Von Koopa: "That's it for today." [7:33 PM] Ludwig Von Koopa: Like, the entire show? [7:33 PM] Ludwig Von Koopa: "Stick around, we'll have tons of stuff tomorrow." [7:34 PM] Ludwig Von Koopa: Any thoughts for today? [7:34 PM] Ludwig Von Koopa: Last ones? [7:34 PM] RawkHawk2010: Want Tennis. [7:34 PM] RawkHawk2010: Don't want Mech game. [7:34 PM] RawkHawk2010: Want Challenge Battle Mode. [7:34 PM] RawkHawk2010: REALLY want the Challenge Battle Mode costumes. [7:36 PM] RawkHawk2010: I get the feeling Treehouse Live will have value tomorrow. [7:37 PM] Ludwig Von Koopa: Well, it better, or I'll be sad. [7:37 PM] RawkHawk2010: The Color Splash trailer happened on the last day in 2016, remember? [7:37 PM] Ludwig Von Koopa: SO WE CAN STILL SEE ACE ATTORNEY? [7:37 PM] Ludwig Von Koopa: YAY!! This is the LAST reaction log for Wednesday! Come back tomorrow on Thursday, and hopefully there will be value! ZeRo was on the segment immediately preceding this, playing Mario Tennis Aces. The first reaction log of Thursday, Day 3. There's new content, including content not mentioned in the Nintendo Direct!